Twas the night before Christmas, when all through the house, Not a creature was stirring, not even a… crochet mouse! This teeny tiny crochet mouse is as cute as can be especially if you dress him up for the holidays… how about a little crochet santa hat?! 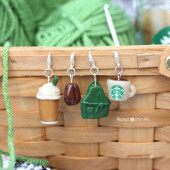 A perfect tree ornament, present topper, or just a cute piece to have any time of year. You could also stuff it will cat nip and gift it to your cat! Make a whole mouse family! – Worsted Weight Uarn. 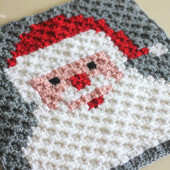 I used Lion Brand Vanna’s Choice in Silver Heather. 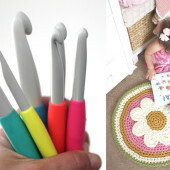 – Size G Crochet Hook. Finished mouse measures about 3 inches long and 1.5 inches wide. Now is a good time to add your safety eyes and begin to stuff with poly-fil. Eyes should be between round 5 and 6 and leave 3 stitches between the eyes. With tapestry needle weave in strands so the bottom closes. To do this you will make what is almost a SC decrease with your tapestry needle (but no yarn over). Just insert your needle under front loops of two crochet stitches. Keep doing this all the way around and pull tight. Leave extra yarn hanging for the tail. Magic ring, chain 2 and make 4 DC in ring, chain 2 and join to ring. Pull tight. Don’t join. You should have a half circle. Sew ears on behind the eyes. This is SUPER cute. I can't really understand patterns though. Could you make videos to go along with your patterns? So nice, this cute little Christmas mouse. This mouse is a quick little Christmas ornament to make. Thanks for sharing this clear pattern. 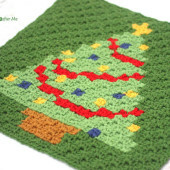 This is adorable, as are the rest of your patterns! Thank you so much for sharing everything you do! I will be making several of these with my leftover bits of yarn (minus the eyes) for my cats – they will love them! thank you!!! these are the perfect gift for my kids' stockings! i've made one for each kid to peek back at them when they open their stockings!! such a cute pattern. Merry Christmas! This is simply adorable. Thank you for sharing your pattern with us! Hey Sarah, a very Merry Christmas to you and yours. I’d love to make these for my feline fur-babies, unfortunately, I have one that is so sassy, she’d definitely rip it apart. Honestly, I’ve bought her dog toys and she’s destroyed them…. lol Thank you for this cute little mouse. I wanted to let you know I shared your pattern via a post on my blog with credit to you. If I missed something, please let me know. Thank you for this excellent pattern. I leave the eyes off and make cat toys for my friend’s cat. I really enjoy your site. Thank you so much.